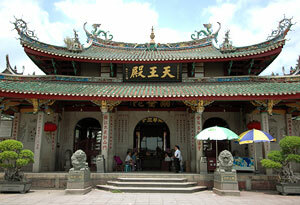 Jimei is a small town on the side of the bank facing north Xiamen Island. 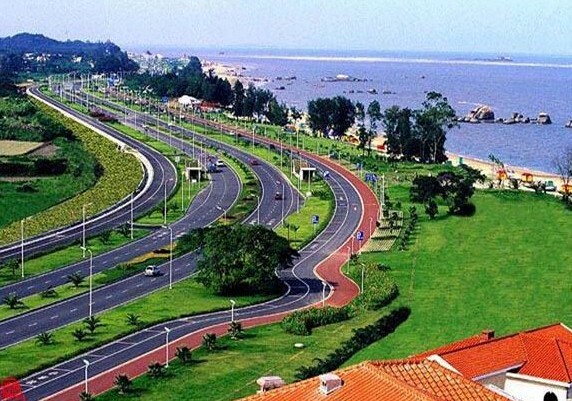 With both Gaoji Causeway and Xingji Causeway meeting there, Jimei becomes the sole gateway into Xiamen. 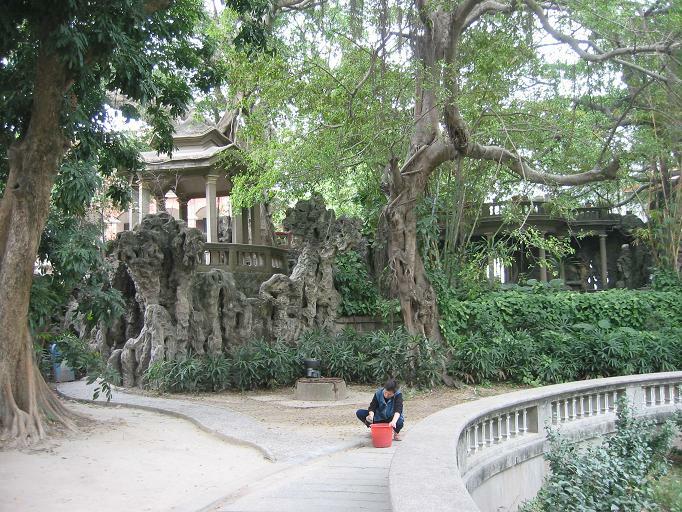 As one of the four major scenic spots in Xiamen, Jimei enjoys long-term fame for its tourist attractions like Turtle Garden, Returnees Garden and the former residence of Mr. Tan Kah-Kee. 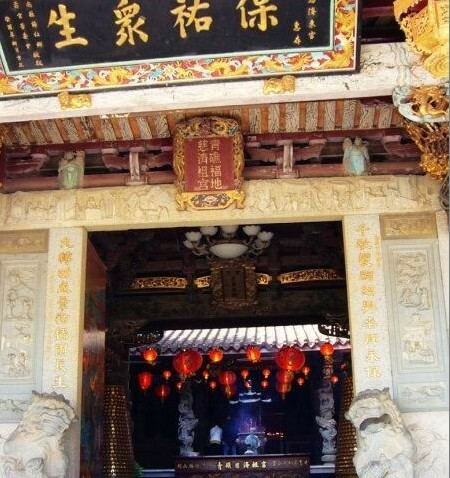 Jimei is the hometown of Mr. Tan Kah-Kee, a famous overseas Chinese leader who devoted himself wholly to education. In this small hamlet, Mr. Tan built 12 different kinds of schools including Xiamen University, a science center, gymnasium, library, hospital, and a navigation club. 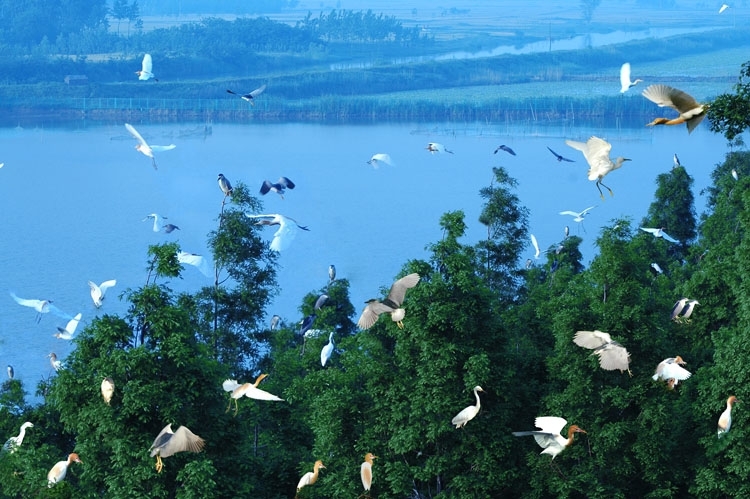 These facilities changed Jimei from a rural village into a sizeable town whose total student population of more than 100,000 exceeds that of the local residents. All of Mr. Tan's buildings are constructed in his unique blend of Western and Chinese architecture, using red brick, white stone, and glazed tiles. Owing to the presence of these science halls, libraries and hospitals, the town was called "Jimei School Village" - a name renowned at home as well as abroad. The former residence of Mr. Tan is situated on Jiageng road in the town of Jimei. It still keeps its old look and visitors will contemplate its history. Mr. Tan lived frugally all his life. 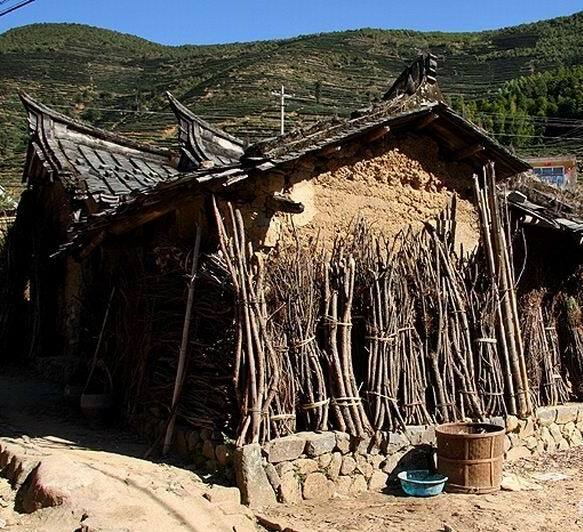 No one can be unmoved when they see how simple these daily necessities and clothing are. To the west of the residence is an exhibition of Mr. Tan's life story. Mr. Tan's former residence is now opened to visitors as a memorial hall and Returnees Garden and includes Mr. Tan's bronze statue as a memorial to him. 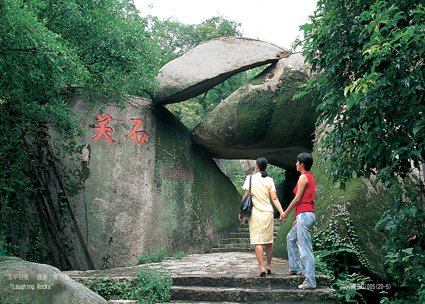 If you're up for a grave undertaking, visit Tan's mausoleum, on the island of Aoyuan, or Turtle Park. 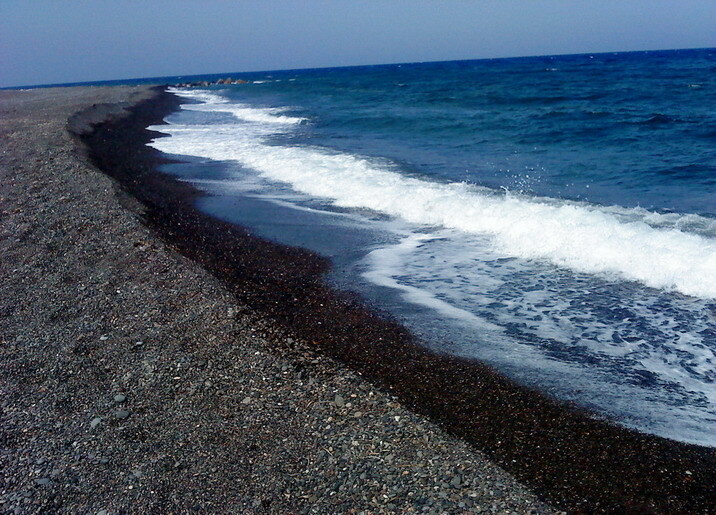 The island is shaped like a turtle, a common shape for graves, because the turtle suggest longevity. 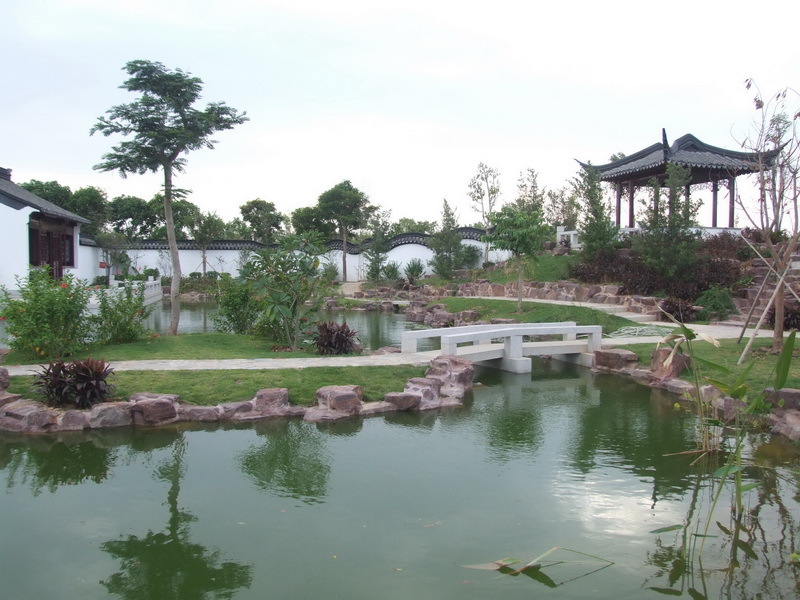 The Turtle Garden, which lies in the south-east of Academic Village Jimei, was built by Mr. Tan during his life time and later was chosen as the gravesite of Mr. Tan. The Turtle Garden was his first project. After full deliberation and preparation, the construction of the Turtle Garden began in 1951 on the former site of "Turtle Head Palace" from which it got its present name. Mr. Tan was general designer as well as general engineer. 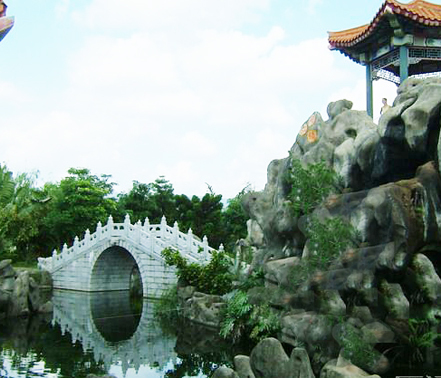 The Turtle Garden project was divided into three parts: the covered corridor, the monument of Jimei liberation and Tan kah kee's tomb. Ten years passed from the beginning of construction in 1951, with the essential completion in 1957 with the burying of Mr. Tan and the covering of the tomb. Turtle Park has a marvelous display of Hui'an style carvings lining both sides of the entrance hall. These friezes depict, in stunning detail, various historical scenes and personages from ancient and modern China. One carving of a political session around a round table looks so 3-dimensional and lifelike you can almost hear them debating about how to run us foreign devils off. Jimei Liberation Monument, with an inscription of Mao Zedong on the front and a tablet record written by Mr. Tan on the back, stands in the centre of the garden. The stone foundation of the monument consists of two stages. The low stage has eight steps which represent the eight-year Anti-Japanese War, the upper stage consists of three steps, symbolizing the three year Liberation War. They tell the later generations that victories were hard-won and therefore should be cherished. 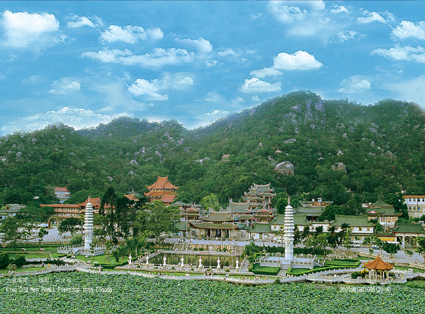 The foundation of the monument is surrounded by gray jade carvings and relief sculptures polished with great care, embodying a concentrated reflection of exquisite workmanship and a unique style of south Fujian stone carving art.